RITES Recruitment department issued an official notification for the Government jobs for Mechanical engineers, Electrical engineers, civil engineers and Signal & telecommunication engineers. There are total 40 vacancies for these job profiles which are going to be filled up through this RITES Recruitment 2019. This is a organization of Mini Ratna Central Public Sector Enterprise under the Ministry of Railways, Govt. of India. RITES organization is a premier multi-disciplinary consultancy in the fields of transport, infrastructure and related technologies. More information related to these Government jobs for civil engineers and other engineers is given below in this article. 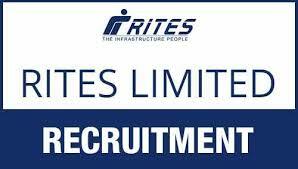 Read the complete article carefully before applying online for this RITES recruitment. Subject:This is in continuation to our earlier advertisement Ref. No. CC/07/2018 dated 31.08.2018 regarding recruitment of Executive Trainees (Electrical) and Executive Trainees (Computer Science). 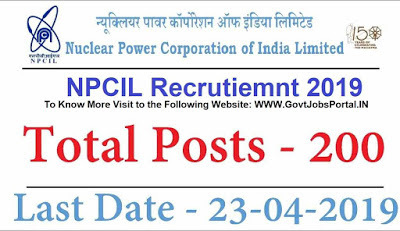 POSOCO Recruitment 2019 for Executive Trainee Posts under Electrical and Computer Science Stream. There are total 80 vacancies which are going to be filled up through this Power System Operation Corporation limited Recruitment process. The procedure for applying these Government jobs in India under POSOCO department is online through the official website. The official Notification related to these engineering jobs has been published on 29th Jan. 2019 on the official website. We also come to know about this POSOCO Recruitment process from that official PDF file only. We shared the link under IMPORTANT LINK section related to these Government jobs for engineers. Read out the complete article carefully before applying online. Total Number of Vacancies: 80 Posts. Powergrid career making opening for all engineering graduates under electronics, electrical and civil stream. Power Grid Recruitment department issued an official notification on their website related to the recruitment for Assistant Engineer trainee posts through GATE Entrance examination. About the Organization: POWERGRID organization is one of the Central Transmission Utility (CTU) of India under Government of India. Power Grid Corporation is one of the major Communication Utilities in the World and a Navratna Enterprise of Govt. of India. Power Grid company is involved in power broadcast business with the command for planning, coordination, supervision and control over complete inter-State broadcast system. Power Grid recruitment department recruit candidates on regular basis as the POWERGRID operates around 1,51,064 circuit kms of broadcast lines along with 238 Sub-stations (as on 31.12.2018). Those who are looking to make a bright career under Powergrid corporation can apply for this recruitment process. To take the rising curve to further heights in your future, POWERGRID is looking for Bright, Committed and Energetic engineers in Electrical / Electronics / Civil disciplines to join its fold as Assistant Engineer Trainee. More information related to this Powergrid career making opening is given below in this job posting. Educational Qualification: Applicants who have one of the following qualification: “BE/B.Tech/BSc(Engineering)” under one of the following stream: “ Electrical/ Electronics/Civil”. Applicants must score at least 65% marks in their graduation classes for applying this Powergrid career making opening. Age Bond: Applicants age must be less than 28 years for applying this Power Grid recruitment 2019. Age be calculated on the basis of the following dates: 31st Dec. 2017. That means on this date applicants age must be less than 28 years. Those who are not exempted from the payment of application fees related to this Power Grid Recruitment 2019 (only SC/ST/PwD/ ExSM/ Departmental candidates are exempted), you are required to login to your applicant login section and then deposit non-refundable application fees of Rs. 500/- through online mode. On submission of application fees, your application process will be treated as complete. 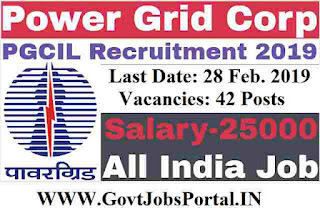 The online application for applying this Powergrid career making opening will be live on 31st Jan. 2019 onwards, involved and qualified applicants have to register themselves online through the official website, regardless of the applications made earlier for any other post/recruitment process in POWERGRID, at POWERGRID website www.powergridindia.com with details of their GATE-2018 registration number and other required information. 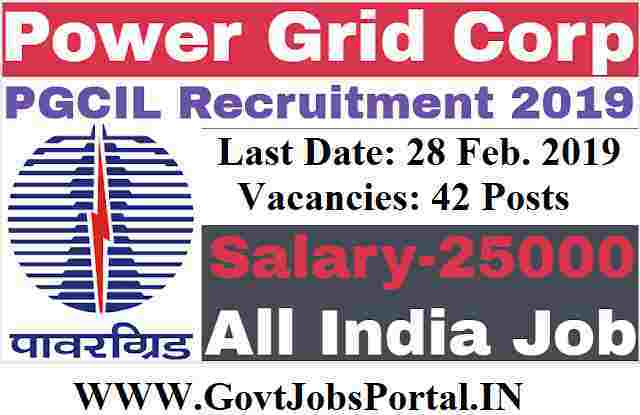 The online application related to this Power Grid recruitment will be accepted up to 28th Feb. 2019. Any other mode of proposal of application form would not be accepted be the company. Fill up other details in the application very carefully before submitting the application form. 31ST Jan. 2019 is the Starting Date to apply. Graduate Aptitude Test in Engineering (GATE) is a premier examination for graduate engineers who are aiming to secure a job in the PSUs or proceed for higher studies in IITs/ NITs, etc. These career defining goals of each aspirant are achieved with rigorous preparation and practice for more than 100 days. The GATE exam pattern comprises 65 questions and is divided into two sections — general aptitude (GA), which includes 10 questions and technical section, which has 55 questions. The technical section has about 20 questions in NAT format, while the remaining are MCQs. In all, candidates have 3 hours to answer the exam. In the GA section, question one to question five carry one mark, while question six to question 10 carry two marks. In the technical section, question one to question 25 carry one mark while question 26 to question 55 carry two marks. Negative marking for MCQ is 0.33 for one-mark questions and 0.66 for two marks questions. NAT questions do not have negative marking. Candidates should follow their desired method of attempting the question paper. Preparation for GATE is considered to be complete only once the exam is taken. ■ Solve the entire paper in one or two scans. ■ The procedure is: Click on each question, read the complete question, understand the question and answer it in the first attempt (without any guesses). ■ Always solve easy questions in minimum time in a single go. ■ Hard or lengthy questions can be kept for the second scan of the paper. ■ Answering any question should not take more than four to six minutes. ■ All the unsolved and reviewed questions must be attempted only in the second scan. ■ Candidates are provided with a notepad, which is used for attempting and solving questions in GATE. ■ Candidates may treat this as an offline exam, where they can solve questions and answer them on the notepad with options. ■ After 100 or 120 minutes, candidates can start marking the answers on the online system in a single flow. ■ GATE exam includes more than 20 NAT questions, which do not have any options. So, there is always an uncertainty about the correct answer. Therefore, a candidate should spend more time on these questions, only if she is absolutely sure about the answers. Else, one can skip the questions and come back later. ■ Your aim should be to attempt more than 50 questions, which you are confident about. ■ Restrict your guesswork to a maximum of two-three questions only if you are able to eliminate two options in an MCQ. ■ You may guess the answer for NAT as these do not carry negative marks. Choice of section to attempt first: GA or technical section. ■ Generally, candidates have a tendency to begin from the very first question, therefore it is advised to first attempt GA section and secure at-least 10-12 marks from this section. ■ Also, the candidate can then focus on technical questions till the last second of the exam. ■ If a candidate is confident about technical section, she can proceed with it first, followed by the GA section. NALCO is stands for “National Aluminum Company”; A Government of India Enterprises. Those who are looking for the Government Jobs in India then this is a career making opportunity in NALCO. NALCO Recruitment department introduce an official notification on their official website; related to this NALCO Career making opportunity for all Engineering candidates. 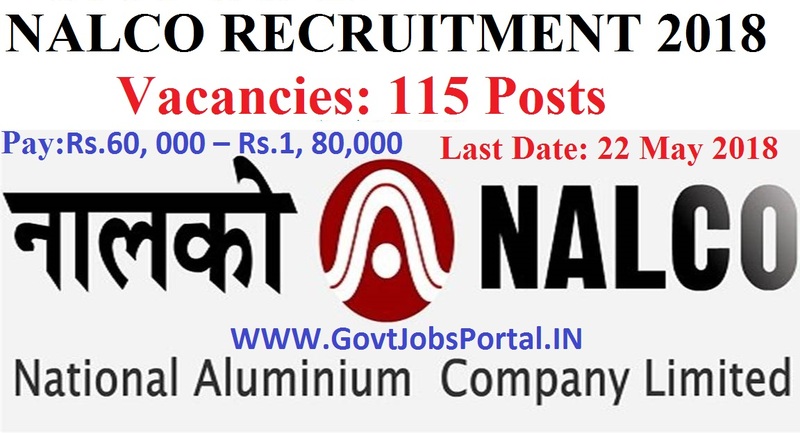 Recruitment department of NALCO said that they are going to fill up 115 posts under various Engineering trades which are as follow: “Mechanical, Electrical, Metallurgy, Electronics and Instrumentation”. Profile Name: Graduate Engineer Trainee. Vacant Positions: NALCO Recruitment department said that, they are going to fill up Total 115 Posts under this recruitment process. For Mechanical Trade: 52 Posts. For Electrical Trade: 32 Posts. For Metallurgy Trade: 18 Posts. For Electronics Trade: 05 Posts. Pay Band: Rs.60, 000 – Rs.1, 80,000 per month. 1). Educational Criteria: All Indian candidates who have successfully completed their Graduation under one of the respective Engineering stream (Mechanical, Electrical, Metallurgy, Electronics and Instrumentation) can apply for this NALCO Career making opportunity 2018. 2). Age Bond: Only those applicants are eligible whose age is less than 30 years as on 22nd May 2018. What is the Application Fee to be paid for this NALCO Recruitment? Candidates who are belonging to the Gen. Catagory have to pay Rs.600 as their application fee, while SC/ST/PWD Cat. Candidates have to pay Rs.100. Payment can be done through INTERNET BANKING, CREDIT and DEBIT CARDS. Indian candidates who meet with the all criteria, which we explained above, can apply ONLINE for this NALCO Recruitment process. You have to visit online Official website of NALCO department for applying these jobs. Beware of FAKE website. Check the IMPORTANT LINK section below for advertisement link and online application form link. 23RD April 2018 is the Starting Date to apply. 22nd May 2018 is the Last Date to apply.